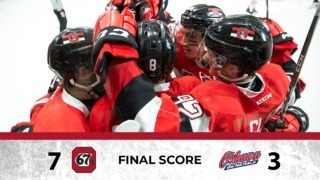 It took 14 long shootout rounds before defenceman Kyle Auger fired home the game-winner for the Ottawa 67’s, defeating the Kingston Frontenacs 5-4 in the shootout. In a high-scoring affair, the goals came to a screeching halt in extra time. Both teams combined for three goals in 28 shooters. 67’s head coach and general manager Jeff Brown said he thought his team deserved to walk away with two points. The game began with two quick goals, both generated from hard work. First, Patrick White was the beneficiary of a diving poke pass from Tye Felhaber. He got the puck free and played it cross-crease for White, and a 1-0 Ottawa lead at 1:04. Kingston looked to answer, and were able to six minutes later. Cody Caron created the goal, with a speed play around an Ottawa defender, and gave Sam Harding a gift of a tap-in on the left side of the Ottawa goal to tie the game 1-1. The Frontenacs weren’t done there, and came out flying in the second with the man advantage. Brett Neumann’s wrist shot beat Olivier Lafreniere through a screen to give Kingston a lead four minutes into the second. Then, 35 seconds later, they added another to make the score 3-1. However, the 67’s found their way back into the hockey game, catching fire at the end of the second period. First, Mathieu Foget found the back of the net with a wrister for his first OHL goal at 14:12. A torrid pace in the attacking zone continued, and eventually resulted in the go-ahead goal for the 67’s at 16:37. Kyle Auger’s shot from the point gave him his second marker of the campaign, and it was 4-3 Ottawa. The Fronts would tie it again in the mid-portion of the third period, and overtime solved nothing. Ottawa went through most of their forward core in the shootout’s first 12 rounds before turning to defenders for shooters, and Brown decided to send Auger over the boards in the 14th round. The move paid off, with Auger scoring blocker side on Kingston starter Jeremy Helvig. 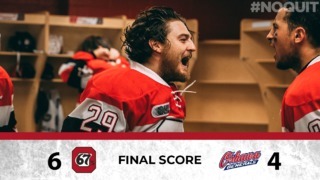 A two-day break for the 67’s lets them hit the ice for practice before entertaining the Niagara Ice Dogs for a Saturday afternoon affair. 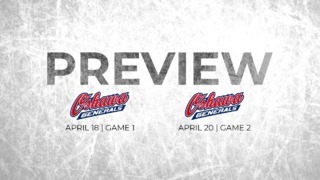 Throwback day at the Arena at TD Place begins at 2 p.m.
Tickets for our Throwback Game are available by clicking here, calling 613-232-6767 x1, or in person at the Box Office at TD Place.